The cafe chair is now available in metal! Made especially for commercial use, this chair will last forever. Unlike most companies which use a use ½” plywood seat, Restaurant Furniture Canada offers you a 1" solid wood seat and a fully welded frame. The frame finish is powder coated and plastic gliders are also included. The wood seat can be replaced by any upholstery option as shown in the options list. 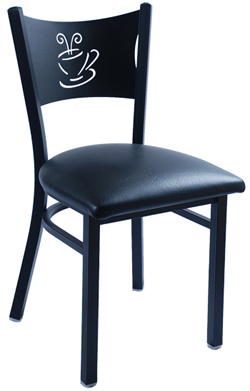 For more information about restaurant chairs, please call (888) 998-4222.